Update May 7th: According to ScreenRant, the ticket pre-sales indicate that Star Trek is true blockbuster material. Taking the ticket sales of Wolverine into account, Star Trek might very well reach or even break the 100 Million mark on its first weekend, blasting ahead two other Trek movies at least. Update May 9th: The movie earned around $29 million, so Star Trek doesn’t seem to be able to break the 100 immediately (Update: indeed it couldn’t – my prediction was right. Yay.). Update May 17th: Another Yay! the numbers I work with in my internal Excel sheet seem to be right. The ranking based on sold tickets is exactly the same! Final Update: Star Trek is officially the second most grossing entry of the franchise (see updated chart below). 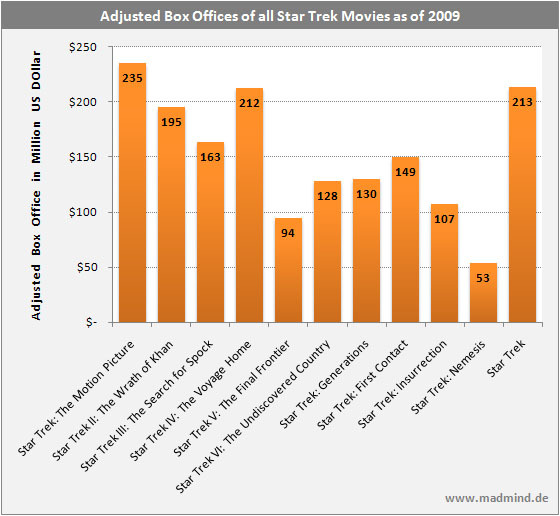 Star Trek 2009 aside, this chart got me by surprise. According to these numbers the most successful Star Trek movie of all time neither was The Wrath of Khan nor the fourth installment with the whales (although it comes close). No, it’s the first movie called Star Trek: The Motion Picture with an adjusted box office of 235 Million USD. Admitted, I would have never guessed this. This chart also shows that although the second movie might get much love from the audience and fans it didn’t break the record of the first movie. Luckily, it came close. At least my impression of the success of The Voyage Home was not wrong as wrong as with Wrath of Khan. Whew. But there is also one nasty thing that gets obviously visible: after a good dive of The Final Frontier, Star Trek never managed to reach its former heights again. Although the movies indeed increased their respective box offices again, we can say that from Star Trek 6 to Star Trek 9 the numbers didn’t vary very much. Star Trek: First Contact is a small exception to this rule yet the quality of the movie didn’t result in an enormously increased box office. Well, after First Contact there was only one way for the franchise: down. Can J.J. break this curse? The next few weeks will tell us. Star Trek is not Star Trek without its episodes. Of course, the movies play an important role (especially in today’s times where J.J. Abram’s take is the only thing “trekkie”) but Star Trek was and is primarily a TV franchise. This chart shows the sad but very well known truth about this franchise: with each new series, Star Trek went down a little bit further. As you can see, The Next Generation is the big exception of this rule. What’s astonishing is the rather small decline of viewership in the first two abysmal seasons. On the other hand, it is visible that even this series began a downward trend. In this case, however, the producers seemingly made the right decisions and managed to stop this trend at the beginning of the third season (to be precise with the episode called “The Bonding“, “Who watches the watchers” was the last one of the bottom). It’s also noteworthy that each new series after TNG indeed had its chance. Every pilot had a massive Nielsen Rating compared to the rest of the respective seasons yet this factor wore out extremely fast. Basically, for every new series the Nielsen Ratings was in a free fall for at least one season. It will be interesting to see whether a new Star Trek series will be able to reverse the numbers and reach the former heights. At the moment it is highly unlikely, though, that a new series will reach us. Even if the new Star Trek movie will be a massive success, the numbers are too depressing and too obvious for producers to risk their money on. But I could also be very wrong with this assumption. What do you think? Well, I just wanted to tell you that your charts gave me a lot to think – really a lot… Although I’m having difficulties writing my project, if I ever succeed, I’ll make a point quoting your page. Thanks for the praise and yes, of course you can keep in touch. Your project sounds interesting. This article is fantastic – exactly what I was looking for. 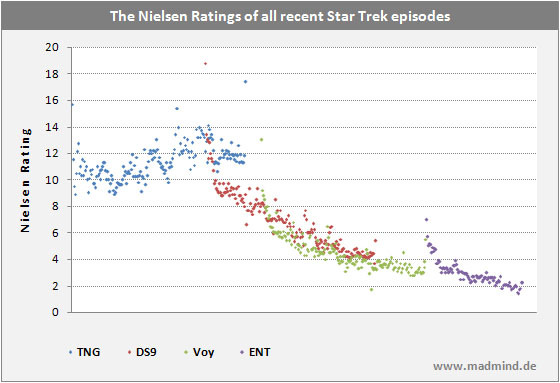 Seeing ratings data in a graph like this really makes it easy to see trends over time. I wonder if the decision to cancel a TV series usually takes place when the ratings are on a long decline and cross some threshold of profitability or opportunity cost. Then again, as you point out, ratings week-to-week don’t tell the whole story. First of all, there is critical acclaim – maybe you could try plotting a scatterplot of ratings vs. fan reception (you could take the fans’ rating for each episode out of 5 stars from memory-alpha.org for example) and see if there is a positive correlation – my guess is the relationship would be only weakly positive. For example: I loved the later seasons of Deep Space Nine and yet the ratings were in decline. Enterprise had some great season 4 episodes and yet the ratings were in decline. I would love a copy of the episode ratings spreadsheet you put together. Any chance I could have a copy forwarded? Hi, MadMind! I guess it’s time I told you I started my grad school on Star Trek. I’m literally going mad on the subject I saw your graph has been reposted on Star Trek Magic and I had to come and visit. I decided to work on the post-Cold War optimistic view on foreign policy that can be read from STNG. Wow, certainly a lot went into this. I’d like to point out a few flaws IMHO, though. First on The Motion Picture being the highest grossing of all films. This isn’t surprising when you consider the ten year wait for our crew to come back and the huge success of Star Wars. The same effect accounts for the 2009 reboot movie’s success. The hero in all the movies is The Wrath of Khan. Done on a shoestring budget due to the critical failure of TMP(which isn’t a bad film if you watch the original director’s cut), it saved the franchise without a doubt. It also had superb acting, excitement and most importantly a compelling story paying homage to the history of Trek. This story allowed for a three part series w/ The Search For Spock and The Voyage Home all being successful. Agreed STV was a mess and STVI was more of a political movie out on it’s own, commenting on the end of Communism. Generations had a natural curiosity to it being the first TNG movie and the Borg always reels viewers in. The rest of the other TNG movies are nightmares best forgotten! As to the series, you don’t include TOS, but the irony there is that it had the highest ratings of all! But of course it was a different time. 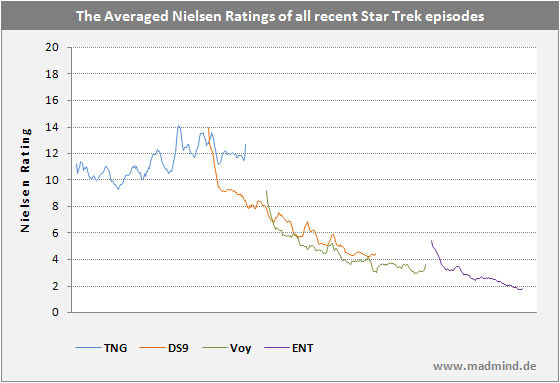 So when we look at TNG ratings, they have an unfair advantage over Voyager and even Enterprise. TNG was syndicated in every major market, reaching the whole country, accounting for higher ratings as well as viewer loyalty, as you knew when and where it would be on each week. DS9 did start off well, but when looked at in depth seems to have lost viewers when Worf was forced upon the show. Even so, ratings were respectable averaging about 5 mil/wk over the shows lifetime. Voyager is a unique situation at the time of introduction, UPN was a fledgling network and Voyager was it’s flagship show. However due to this not being syndicated, but on a network, it was not available for viewing in many markets across the nation, including NYC. As time went on and UPN failed to succeed, more and more affiliates jumped ship, leaving more markets w/o the opportunity to view Voyager. Enterprise suffered even worse as UPN was certain to end at this point. It also had a fatal flaw built in from the start–prequel status, throwing all that loyal viewers thought they knew under the bus. Into Darkness succeeding doesn’t mean much to our universe. It’s a time of marginal acting, paper thin scripts, no respect for the past and whiz bang CGI effects. As long as it delivers action packed scenes, an interchangeable score and hot, young cast it will succeed. You see, being an “old true blue” Star Trek fan is obsolete. As we are in danger of becoming if we don’t adapt to what the casual movie goer wants. Personally, I’d rather die with my boots on and think of all Star Trek reboot movies as stand alone action flicks, with no connection to the rich history I love. Taken as that, perhaps I can find some enjoyment in the new universe. This is great post. the rating question bothered me for a long time. I think it is simple: NG was a good show the rest much less so. Except Tory that was annoying as hell, everyone at NG were quite good actors and the plot was good. DS9 had an annoying commander. Prude, full of himself. I kept wishing someone will kill him and the that someone will conquer the station. The same with the two other series. I think if the writers gave a chance to the idea that someone would blow up these two annoying ships, the ratings would have been much higher. What is the X axis of your Nielsen rating plot? time? The Adjusted Box Offices for the movies do not exactly tell the whole story, I’m afraid. You see, there is something that many people today forget (this is something I have never even considered before we discussed this in my Economics class) is that older movies would run in the movie theaters for a much longer amount of time than today, simply because there was no rush to get the movies out of the theaters and into homes because very few people could afford to do that at first. So the longer the movie would stay in the theaters, the more money it would make. Even if we were to take a look at Adjusted Box Offices for those movies for a certain amount of time (such as one year after their release), I don’t feel that it would tell us the whole story because I feel that people back then didn’t feel the need to hurry up and see a movie while it was in the theaters simply because it would have accepted that it would have still been in the movie theaters the next time they went out. I don,t think this has much to do with the writers or the setting of ds9 or voyager or enterprise. I am a big fan of tng and for me that is the real star trek, gene roddenberry had a nice trial run with ost and finaly he made the real star trek and its name is the next generation. I believe that the decline in ratings for ds9 is the lack of the family feeling which every drama needs to thrive, and of course the actors that were chosen for the part. i think sisko should have been played by another actor. the second thing that is troubling is miles o brian and worf in ds9 (never do that) unless we are making a few seasons with tng voy ds9 combined to defeat one of the greatest enemies in the history of the federation or someting like that. Voyager at first i didn’t want to watch it , but why???? i don’t know. maybe because it took away from my tng experience? or maybe it wasn’t on tv on the right time, but for the most part i didn’t know it existed. in retrospect i find the voyager better written then the other series.so i don’t think it has to do with writing. Enterprise .the first episode was great after that it really became a bore. I think this series should have been done 1 season 1 mission in other words you have to watch the first episode or else you won’t understand, like with the expanse story.the whole series should have been done like the expanse story, why? dont do diplomacy because you can never defeat picard , so all that has already been explored on tng. i dont and nobody for that nmatter expects the captain of the first enterprise to be a diplomat. i do think it was a wonderful crew. Tremendously useful resource; well done. Interesting that the Dominion War didn’t revive DS9s fortunes.